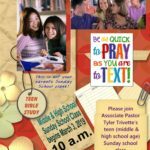 A new Teen Sunday School class begins at MCBC Sunday, March 3 at 10 a.m. The class is specifically for Middle School and High School age students. Come join the class and bring a friend!